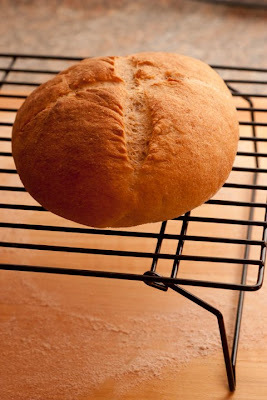 This is the simplest bread recipe I have baked: total of 4 ingredients - flour, yeast, salt, and water. I complicated things a bit by making it partially whole wheat, because I have a tendency to do that, but it's still pretty easy. You get two loaves out of this, so lots of payoff for the effort! Adapted from here on Joy The Baker. Reserve 1/4 cup of whole wheat flour, and place the remaining 3 3/4 cup flour in the bowl of a stand mixer fit with a paddle attachment. Add the salt and yeast, and pour in the warm water. Mix on low speed until the dough just comes together. When the dough comes together in a mass, switch to the dough hook and mix on medium speed for 2 minutes. Dough should clear the sides but may stick to the bottom a bit. If the dough feels too sticky or too dry, add a bit more water or flour by the tablespoonful. After 2 minutes, let the dough rest for five minutes. After the five minute rest, knead the dough again for 3 minutes on medium speed (I did this step for 5-6 minutes, just because the dough didn't look ready after 3). 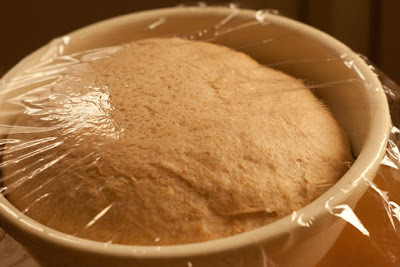 Place the dough on the counter and, using the 1/4 cup of whole wheat flour that was reserved in the beginning, hand knead the dough. You may not need to use the whole 1/4 cup, just knead until the dough feels firm and solid. Form dough into a smooth ball. Place the dough in a lightly oiled bowl, and turn the dough over to coat the entire dough lightly in oil. 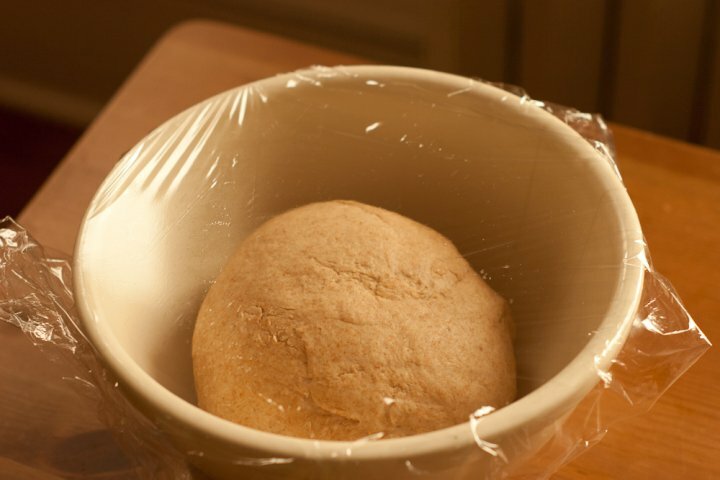 Cover with plastic wrap and a kitchen towel and place in a warm spot to rest for 1 1/2 hours. The dough should double in size. Remove from the bowl, punch down and reform into a ball. Return to the bowl, cover and allow to rest for another 30 minutes. After the second rest, place the dough on a lightly floured surface and cut into 2 equal pieces. 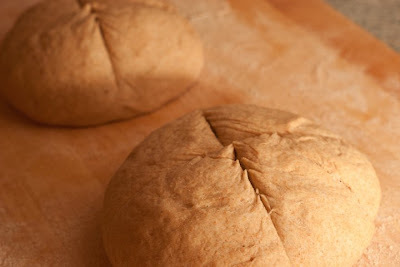 Form each piece into a smooth, round ball, tucking any rough edges underneath the dough. Cover with a damp cloth and leave to rest on the lightly floured surface for about an hour. During the resting period, preheat the oven to 450 degrees F. Place a baking rack in the lower third of the oven and leave either a baking stone or an upside down baking sheet in the oven to preheat as well. I didn't have a baking stone when I made this, so I used a cookie sheet. After you put the bread in the oven, take 1/4 cup of water or a couple ice cubes, open the oven, quickly throw the water or ice onto the oven floor and immediately close the oven door. You want to keep the steam in the oven. Wait 2 minutes and repeat the process. 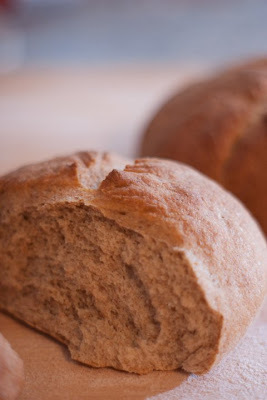 Bake loaves for 20-25 minutes. They should be golden brown and should measure 190-210 degrees F in the middle. 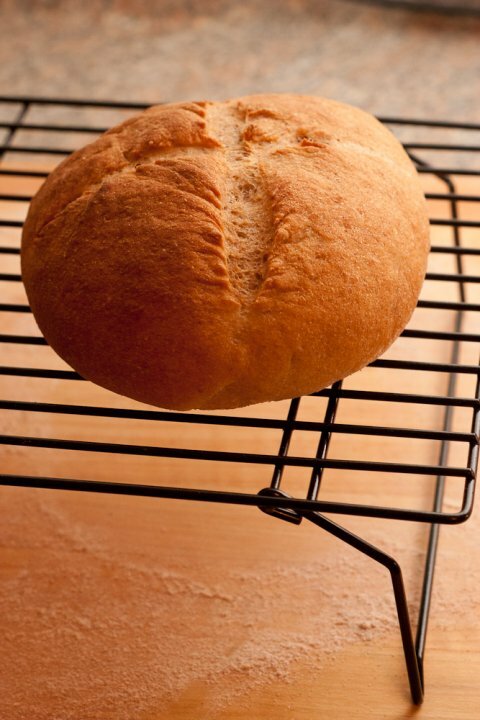 Let bread cool completely on a rack before eating. The crust is great the first day, and if you store it for longer, a light toast is nice. Hey, one thing I've found out: If you have a roasting pan, you can stick it in the oven with water and that will generate plenty of steam for the bread. Just stick that on the lowest rack below your baking stone. You also avoid opening up your oven door a bunch of times this way. I don't know how long you've been making bread, so if this is a method you love, then great! Cool, I'll try that next time. We didn't have a stone when I made this (it was a while ago), but we got one for the wedding. I'm excited to try baking bread on it. I'd love an update when you use the baking stone. I've been so curious if it helps the crust enough to be noticeable. Hi Susan - I'd definitely like to give that a try at some point!